Kids will love Marble Painting! It's fun to watch the marble smear different colors of paint around the 'canvas' and make a beautiful masterpiece! Marbles are choking hazards, toddlers will love this craft but they need to be closely supervised! 1. Drip small drops of paint onto a paper plate. If you make your paint drops too big, the marble may get stuck in the paint. 2. Place your marble into the paper plate and start rolling your marble around by holding and rotating the paper plate. 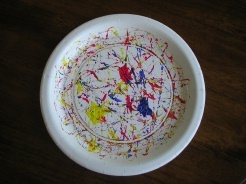 Check out our other Marble Painting Crafts: Paper Plate Fireworks, and Paper Plate Spider Web. Click here to find more Summer Crafts like Marble Painting!